Plants protect themselves from intense sunlight by rejecting much of it as heat—sometimes far more than needed to prevent damage. Engineering plants to be less cautious could significantly increase yields of biomass for fuel and crops for food. But exactly how the photoprotection system turns on and off has remained unclear. MIT researchers have now gathered new insights into the protein that controls the switch. They zapped individual copies of that protein with a laser and used a highly sensitive microscope to measure the fluorescence emitted by each protein in response. Based on those tests, they concluded that there are two distinct mechanisms by which the dissipation of heat begins. One is a split-second response to a sudden increase in sunlight, say, after a cloud passes by, while the other activates over minutes to hours as light gradually changes during sunrise or sunset. In both cases, the response is triggered by a specific change in the protein’s structure. Plants rely on the energy in sunlight to produce the nutrients they need. But sometimes they absorb more energy than they can use, and that excess can damage critical proteins. To protect themselves, they convert the excess energy into heat and send it back out. Under some conditions, they may reject as much as 70% of all the solar energy they absorb. “If plants didn’t waste so much of the sun’s energy unnecessarily, they could be producing more biomass,” says Gabriela S. Schlau-Cohen, the Cabot Career Development Assistant Professor of Chemistry. Indeed, scientists estimate that algae could grow as much as 30% more material for use as biofuel. More importantly, the world could increase crop yields—a change needed to prevent the significant shortfall between agricultural output and demand for food expected by 2050. Critical to the first steps of photosynthesis are proteins called light-harvesting complexes, or LHCs. When sunlight strikes a leaf, each photon (particle of light) delivers energy that “excites” an LHC. That excitation passes from one LHC to another until it reaches a so-called reaction center, where it drives chemical reactions that split water into oxygen gas, which is released, and positively charged particles called protons, which remain. The protons activate the production of an enzyme that drives the formation of energy-rich carbohydrates needed to fuel the plant’s metabolism. But in bright sunlight, protons may form more quickly than the enzyme can use them, and the accumulating protons signal that excess energy is being absorbed and may damage critical components of the plant’s molecular machinery. So some plants have a special type of LHC—called a light-harvesting complex stress-related, or LHCSR—whose job is to intervene. If proton buildup indicates that too much sunlight is being harvested, the LHCSR flips the switch, and some of the energy is dissipated as heat. It’s a highly effective form of sunscreen for plants—but the LHCSR is reluctant to switch off that “quenching” setting. When the sun is shining brightly, the LHCSR has quenching turned on. When a passing cloud or flock of birds blocks the sun, it could switch it off and soak up all the available sunlight. But instead, the LHCSR leaves it on—just in case the sun suddenly comes back. As a result, plants reject a lot of energy that they could be using to build more plant material. Much research has focused on the quenching mechanism that regulates the flow of energy within a leaf to prevent damage. Optimized by 3.5 billion years of evolution, its capabilities are impressive. It can deal with wildly varying energy inputs: In a single day, the sun’s intensity can increase and decrease by a factor of 100 or even 1,000. And it can react to changes that occur slowly over time—say, at sunrise—and in just seconds, for example, due to a passing cloud. Researchers agree that one key to quenching is a pigment within the LHCSR—called a carotenoid—that can take two forms: violaxanthin (Vio) and zeaxanthin (Zea). They’ve observed that LHCSR samples are dominated by Vio molecules under low-light conditions and Zea molecules under high-light conditions. Conversion from Vio to Zea would change various electronic properties of the carotenoids, which could explain the activation of quenching. However, it doesn’t happen quickly enough to respond to a passing cloud. That type of fast change could be a direct response to the buildup of protons, which causes a difference in pH from one region of the LHCSR to another. Clarifying those photoprotection mechanisms experimentally has proved difficult. Examining the behavior of samples containing thousands of proteins doesn’t provide insights into the molecular-level behavior because various quenching mechanisms occur simultaneously and on different time scales—and in some cases, so quickly that they’re difficult or impossible to observe experimentally. 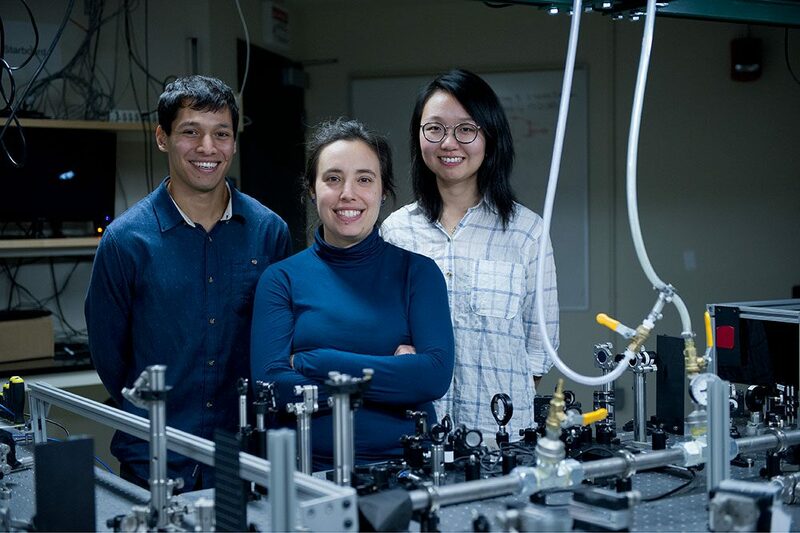 Schlau-Cohen and her MIT colleagues, postdoc Toru Kondo and graduate student Wei Jia Chen, both of chemistry, decided to take another tack. Focusing on the LHCSR found in green algae and moss, they examined what was different about the way that stress-related proteins rich in Vio and those rich in Zea respond to light—and they did it one protein at a time. According to Schlau-Cohen, their approach was made possible by the work of her collaborator Roberto Bassi and his colleagues Alberta Pinnola and Luca Dall’Osto at the University of Verona, Italy. In earlier research, they had figured out how to purify the individual proteins known to play key roles in quenching. They thus were able to provide samples of individual LHCSRs, some enriched with Vio carotenoids and some with Zea carotenoids. Using the measured intensities and lifetimes of responses from hundreds of individual LHCSR proteins, they generated the probability distributions shown in the figures below. In each case, the red region shows the most likely outcome based on results from all the single-molecule tests. Outcomes in the yellow region are less likely, and those in the green region are least likely. Left and middle figures: Fluorescence behavior of Vio-enriched and Zea-enriched LHCSR proteins These figures show probability distributions of fluorescence intensity and lifetime from experiments with hundreds of individual LHCSR proteins enriched with either Vio carotenoids (left) or Zea carotenoids (middle). The most likely intensity-lifetime combinations are highlighted in red, less likely in yellow, and least likely in green. The Vio distribution shows the response when quenching is off. The Zea results show the impact of having quenching switched on: The population moves to a much lower intensity and a much shorter lifetime. Right figure: Fluorescence response to pH changes This figure shows the response of Vio-enriched proteins when subjected to a lower pH, that is, an increase in proton concentration replicating conditions in bright sunlight. Compared to the results with Vio in pH 7.5 (the left figure), the intensity is much lower, and the lifetime is slightly shorter. The significantly reduced intensity indicates that quenching is turned on. But the shift in lifetime is less dramatic than with Zea, suggesting that conversion to Zea and the lowering of pH turn quenching on by two different mechanisms. The left figure shows the likelihood of intensity-lifetime combinations in the Vio samples, representing the behavior of the quench-off response. Moving to the Zea results in the middle figure, the population shifts to a shorter lifetime and also to a much lower-intensity state—an outcome consistent with Zea being the quench-on state. The dramatic decrease in intensity with the Vio-to-Zea conversion and the lowered pH suggests that both are quenching behaviors. But the different impact on lifetime suggests that the quenching mechanisms are different. “Because the most likely outcome—the red region—moves in different directions, we know that two distinct quenching processes are involved,”says Schlau-Cohen. Based on their results, Schlau-Cohen proposes that the LHCSR can have three distinct conformations. When sunlight is dim, it assumes a conformation that allows all available energy to come in. If bright sunlight suddenly returns, protons quickly build up and reach a critical concentration at which point the LHCSR switches to a quenching-on conformation—probably a more rigid structure that permits energy to be rejected by some mechanism not yet fully understood. And when light increases slowly, the protons accumulate over time, activating an enzyme that in turn accumulates, in the process causing a carotenoid in the LHCSR to change from Vio to Zea—a change in both composition and structure. “So the former quenching mechanism works in a few seconds, while the latter works over time scales of minutes to hours,” says Schlau-Cohen. Together, those conformational options explain the remarkable control system that enables plants to regulate energy uptake from a source that’s constantly changing. Schlau-Cohen is now turning her attention to the next important step in photosynthesis—the rapid transfer of energy through the network of LHCs to the reaction center. The structure of individual LHCs has a major impact on how quickly excitation energy can jump from one protein to the next. Some investigators are therefore exploring how the LHC structure may be affected by interactions between the protein and the lipid membrane in which it’s suspended. However, their experiments typically involve sample proteins mixed with detergent, and while detergent is similar to natural lipids in some ways, its impact on proteins can be very different, says Schlau-Cohen. She and her colleagues have therefore developed a new system that suspends single proteins in lipids more like those found in natural membranes. Already, tests using ultrafast spectroscopy on those samples has shown that one key energy-transfer step occurs 30% faster than measured in detergents. Those results support the value of the new technique in exploring photosynthesis and demonstrate the importance of using “near-native” lipid environments in such studies.